The artist talks about painting and the long haul. Your career has been underground for a long time. Why was that? The paintings you have in your studio now are all going to be in your upcoming show at D’Amelio Terras; tell me about them.I decided that I liked the idea of making eight paintings that were all the same size, 80 inches tall by 78 inches wide, and though the show is called “Hollywood Squares,” they’re all off square. My idea was to overwhelm the gallery with a series of strong paintings that are a continuation of what I’ve been doing, except that I’ve moved it to another place. I’d been in Germany in the spring and had broken my ankle, and when I came back in May, I was laid up for weeks, and started making colored pencil drawings in preparation for the paintings. As soon as I could move around, I started making these, and they all came out in the space of two months. They seem to hark back to earlier eras in modernism; is that intentional? I’m not interested in summing up the history of painting or revitalizing modernism. I just don’t care. I’m interested in how do you move abstract painting forward. Of course, I love Matisse, I think that’s obvious. I don’t feel like I’m looking to bring back a certain era, though I can certainly use the tools of some of those places. I remember in the late ’80s going to this huge Morris Louis show at MoMA and being blown away by his skeins of colors. I’ve always liked Louis, but I’d never thought about him before, and I literally came home and pretty much changed my work because of that show. That’s when I think I stopped using paint and started using transparencies of paint. Now, that didn’t mean that I wanted to be a stain painter. I like the idea of staining, but I don’t want to be a Morris Louis. I’m just kind of being in my own zone at this moment. 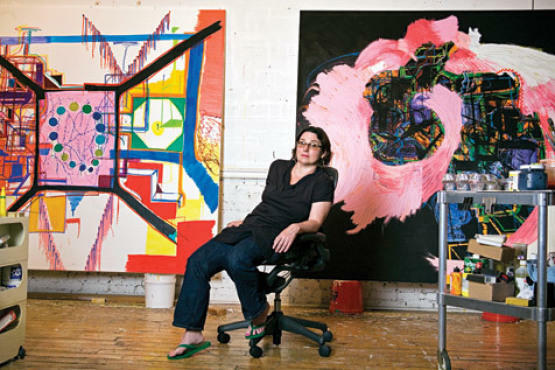 Greenbaum’s work will be on view at D’Amelio Terras starting Sept 10.